The quality of the water in an estuary influences the health, abundance and survival of the plants and animals that live in or pass through it and the suitability of estuary water for contact recreation. For the plants and animals it is the concentration of toxicants and oxygen in the water that can affect the survival of species and excessive nutrient concentrations can affect the growth of nuisance macroalgae, phytoplankton and microphytobenthos. For contact recreation it is the concentration of faecal indicator bacteria and hence the likely presence of pathogens that can affect human health. Red areas – Coastal AE water, the remainder of the estuary is classified Coastal CR water. The following is a case study on water quality in the Estuary of the Heathcote and Avon Rivers/Ihutai in the south-east of Christchurch. 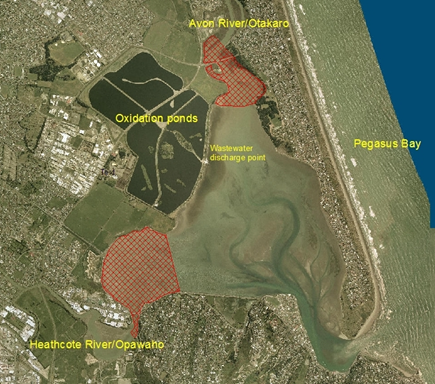 The Canterbury Regional Coastal Environment Plan has assigned two water quality classes to this estuary. The red shaded areas in the map are designated as Coastal AE water, i.e. for the maintenance of aquatic ecosystems. The remainder of the estuary is designated as coastal CR water, i.e. for contact recreation and the maintenance of aquatic ecosystems. For many years Christchurch tertiary treated wastewater was discharged into this estuary. This wastewater was a source of ammonia nitrogen, phosphorus, faecal indicator bacteria and pathogens to estuary water. Ammonia nitrogen often occurred at potentially toxic (to marine life) concentrations at sites in the vicinity of the wastewater discharge point. When the Christchurch City Council applied to Canterbury Regional Council to renew its’ resource consent to discharge this wastewater into the estuary, it was declined. On 4 March 2010 the wastewater discharge was diverted away from the estuary; the wastewater is now discharged into Pegasus Bay some 3 km from shore. Ammonia nitrogen concentrations around the time of high tide at Penguin Street, South Shore, January 2007 – December 2012. Within months of the diversion of the wastewater there was up to a 90% decrease in ammonia nitrogen and phosphorus concentrations in estuary water. This decrease was interrupted by the 2010-2011 earthquake sequence when raw sewage was discharged to the rivers and directly into the estuary because of broken infrastructure (raw sewage was discharged directly into the estuary in the Penguin Street area). The dissolved inorganic nutrients in the wastewater also meant more than enough nutrients in estuary water to allow for the prolific growth of the nuisance algae sea lettuce and the red algae Gracilaria chilensis. 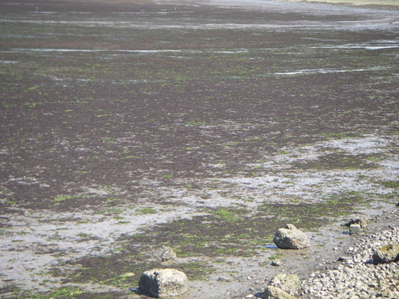 Sea lettuce (green) and Gracilaria chilensis (red) on the mudflats. While there are still post-earthquake issues with infrastructure, in the main the quality of the river water flowing into the estuary now has the largest influence on nutrient concentrations in estuary water. Both rivers arise from springs that are fed from groundwater in the shallow aquifers. Notable concentrations of nitrate occur in the spring water (PDF). It is the nitrates in the spring water that now have the greatest influence on dissolved inorganic nitrogen concentrations in estuary water. However, there are other nutrients sources to the river and directly into the estuary including stormwater (at least 67 outlets into the estuary), point source discharges from industrial sites, infrequent sewage overflows, catchment geology and the presence of large numbers of waterfowl (PDF). When wastewater was discharged into the estuary the suitability for recreation grade at all estuary sites was Poor or Very Poor. With the removal of the wastewater sites now have either a Poor or Good grade http://ecan.govt.nz/services/online-services/monitoring/swimming-water-quality/Pages/Default.aspx. The three sites that still have a Poor grade are within the area classified as coastal AE water. 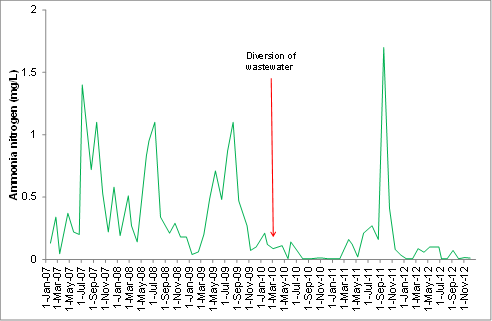 The concentration of faecal indicator bacteria at these sites is primarily influenced by faecal indicator bacteria loads in river water (from waterfowl and dogs; PDF) and one area supports an abundance of waterfowl. Future improvements in nutrient and faecal indicator bacteria concentrations in estuary water can be achieved by improved stormwater quality and reducing the number of industrial point source discharges. It is unlikely that waterfowl or dog numbers will decrease. As this is an urban estuary there will always be human influences on water quality. However, the aim is to minimise the impact on aquatic ecosystems and to allow people to be able to use the estuary for contact recreation without having their health compromised. Lesley Bolton-Ritchie is a coastal water quality and ecology scientist at the Canterbury Regional Council. Can anyone tell me how I start writing my comments in red writing? Is that possible? You just proved my previous blog points to perfection. I made no comment about why I wanted to use red. I made no suggestion that I considered red as bad in this blog. You’ve assumed it was a continuation of concern about how we portray science. Just as the colour red elicits human response, my mention of red has elicited an automatic response by you. I’ve created an expectation by you. Just like that colour red does in the public eye. Thanks, you’ve proved yourself to be a perfect participant in a social experiment. Lesley – Good article. Thanks. vegetation (Figure 3 gives examples of percentage cover estimates for macrophytes). layer (Redox Potential Discontinuity layer – RPD). Composite samples of the top 20mm of sediment (each approx. 5 places!!! How scientific is that? There must be a referenced technique right? Nope. I’d criticise the use of a garden hoe, but I have used more basic instruments than this. Blogs are a form of communication. On some blogs I basically fell like I am beating my head against a brick wall, with little recognition of the points made by contributors. I come over here, with a sore head, and see an Author willing to ‘take note’. It is refreshing and a credit to you Daniel. Not to mention the time taken to make thoughtful sometimes humorous responses to an anonymous commenter. I may sometimes make controversial comments but my underlying goal is achieving the ‘best result for all’. Good science fits into that definition. I posted the above methodology to suggest we need debate about how we monitor nutrients in estuaries. Even though I realise it poses as a diversion which I regard as ‘troll like’ behaviour. Perfect or good or poor – We don’t know, there are no statistics, or evidence of the accuracy of methods. For all I know it could be perfect? For all I know it could be rubbish? That’s not science in my view. At best, bucket chemistry, would be the definition I would give it. Politicians are using this information to target contributors to our economy. If the information is to be used in this way, we either need to criticise the politician or the information. I am not sure which is more appropriate? In the mean time I like to lay the challenge for better science than this. Particularly when the rate payer is paying. I’m now way off topic, so will apologise to the author and exit.